Leverage the power of SMS marketing to collect emails and fuel your email marketing. This integration with Constant Contact would allow you to sync your ProTexting and Constant Contact clients and extend the ability to run comprehensive campaigns via both, SMS and email. One of the most popular campaign types for engaging your clients is Text-to-Win activation. By simply turning on the ProTexting Email Capture feature and asking your subscribers to complete their Sweeps entry by providing their email address, you are now able to collect more data and reach out to your clients in a meaningful way. This will allow you to send them a follow up SMS message, but most importantly now you can sync and upload the email addresses you collected with your SMS campaign, to your Constant Contact account. From there you can continue the engagement via email. If you’d like to import your contacts database to ProTexting, we suggest utilizing our Drip Messaging Campaign. All numbers will be automatically imported into the drip campaign. After you activate and add the groups to the drip, all new imported contacts will start receiving the sequence of SMS or MMS messages. 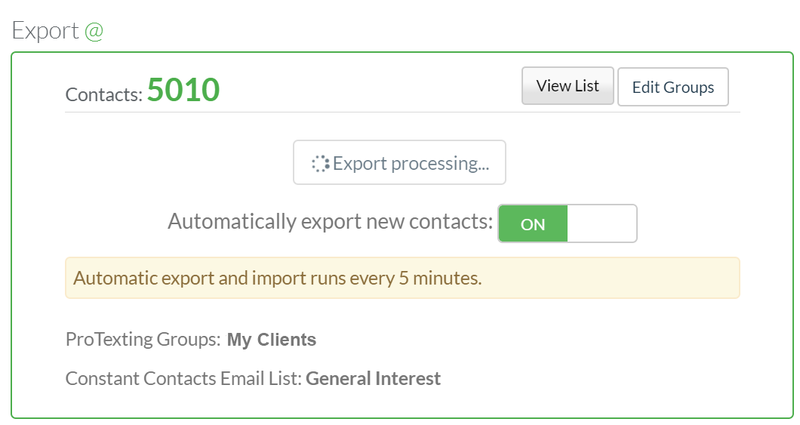 Now, you can easily choose from what groups to import (in Constant Contact) and from what groups to export contacts (in ProTexting). The automatic sync runs every 5 minutes, and it is a great tool to synchronize the contacts on auto pilot. All synced contacts can be entered into different messaging campaigns, such as Drip Campaigns, Sweeps, etc.